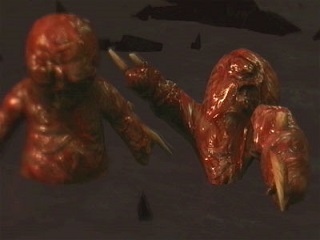 Plague Baby is an Enemy in Demon's Souls. Abortion like beings infesting the plague swamp where Maiden Astraea resides. They can infect the enemy with the plague and are hostile to the Depraved Ones in the area. They can also dive beneath the swamp surface to avoid attacks and they can easily surround their prey. They also spawn infinitely even after death. The plague babies attack in groups when they come out of the swamp. They can quickly surround you and prevent you from moving any further in the swamp, with the plague eating away at you and several of these stabbing you, they can easily kill you if you are unprepared. They may also attack every few seconds then retreat. Like their name implies, they carry the Plague. Though you might not notice, what with their chilling in a plague swamp and all. When you turn away they sink under the swamp (and do so when you attack them as well) and quickly move up to you to attack. Use a Bow. If you have God's Wrath you can dispatch them very easily. These guys are hostile to the Depraved Ones in the room. By backstabbing and kicking a Depraved Ones down to solid ground near the edge of the swamp you can distract the Plague Babies. If you have a Thief's Ring equipped they may not notice you at all, as they congregate near the noisy Depraved Ones. When Garl Vinland and/or Maiden Astraea is/are killed, the Plague Babies won't respawn. They're great for Stone of Ephemeral Eyes farming, so kill away if the mood takes you.